Thomas was born in 1893, the son of William and Leah Davis who were residents of Tauherenikau. Not much is known about his early life. He had three brothers and two sisters. One brother died as a baby of five weeks old. He probably went to Tauherenikau School. As a young man, Thomas went to Australia. There he worked for the Railway Department of New South Wales. He was back in New Zealand World War One started. 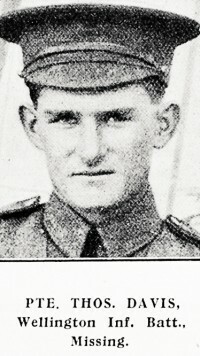 Thomas enlisted on 21 October 1914 with the service number of 10/1222, going into Trentham Camp for training as part of the 2nd Reinforcement. This group of 1700 soldiers sailed out of Wellington Harbour on 14 December 1914, arriving in Egypt at the end of January 1915. Thomas was part of the Wellington Infantry Battalion, which landed at Anzac Cove on the 25/26 April, 1915. In early May, the four battalions of the N.Z. Infantry Brigade were shipped down to Cape Helles to help British troops, to capture the village of Krithia and Achi Baba, the hill overlooking the plain at Cape Helles. On 8 May, the New Zealanders made an attack across flat meadows called the Daisy Patch. It was unsuccessful, with many soldiers being killed or wounded. They did not even see the Turkish soldiers who were firing at them. Thomas Davis was one of the killed but his body was not recovered. His name is on the Twelve Tree Copse N.Z. Memorial near the Daisy Patch.